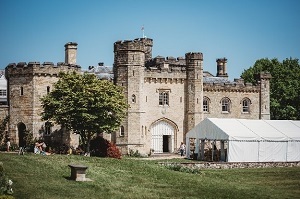 The festival runs at Chiddingstone Castle, near Edenbridge in Kent, across the early May Bank Holiday, Saturday 4 May to Tuesday 7 May. The adult programme includes Joanne Harris, Giles and Mary from Gogglebox, wine expert Oz Clarke, Middle-Eastern cookery writer Sabrina Ghayour, Tracy Borman, Hunter Davies, John Crace, Anna Pasternak and Emma Darwin. The festival also runs a children's programme and a school's day with Frank Cottrell-Boyce, Dan Freedman, Maz Evans and Joseph Coelho. Festival Organiser Victoria Henderson said "We are thrilled with the line-up for this year’s festival; it offers such a wide variety of subjects and speakers, giving our visitors this wonderful opportunity to hear from so many high calibre authors, to take part and really immerse themselves in the joys of the spoken and written word. All are welcome, and as ever we aim to offer something for everyone."